After his ordination as a rabbi, Marvin Tokayer served as United States Air Force Chaplain in Japan. Upon discharge he returned to Tokyo to serve for eight years as the rabbi for the Jewish Community of Japan. He wrote 20 books in Japanese, including several bestsellers; discovered literally the last of the Chinese Jews; located a long-lost Jewish cemetery in Nagasaki; contributed to the Encyclopedia Judaica; acted as a bridge for many travelers between East and West; served the needs of his congregation; and became spellbound by the threads of a story which he began piecing together. His investigation of the facts took him throughout Asia, to Israel and Washington D.C. as he searched for documents and tracked down the people, both Jewish and Japanese, who had taken part in the rescue of Jews from the Holocaust. After his time in Japan, he founded and led the Cherry Lane Minyan shul in Great Neck, New York for fourteen years, while leading tours of Japan, China, India and Southeast Asia. He and his wife are the parents of four children and grandparents of thirteen. 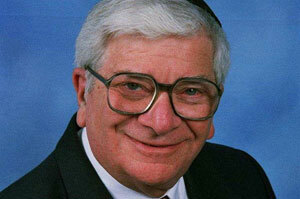 Rabbi Tokayer is in high demand for his dynamic presentations, scholarship, and knowledge of Jewish Asia. Join Marvin Tokayer in his fascinating journey from a college student challenging Chabad philosophy, to the first and only (at the time) Rabbi of the entire Far East, sent by the Lubavitcher Rebbe. Learn that changing the world for the better happens one step at a time. Rabbi Marvin Tokayer served as a US Air Force Chaplain in Japan and returned after his discharge to serve as the Rabbi of the community for 8 years. Rabbi Tokayer shares the captivating story of how the Rebbe’s advice changed his life dramatically. .